DanceXchange, the esteemed Birmingham dance house, has recently announced its latest performance season which runs from 8 February until 26 April. The season is packed full of inspiring and stimulating dance, demonstrating the venue as a huge contender as one of the leading dance houses in the UK. The season is almost a prelude to the dance yet to come in 2018, as DanceXchange builds up to the award-winning Birmingham International Dance Festival. The event will run from 1 – 24 June, offering even more dance to its enthusiastic audiences. First up, however, is DanceXchange’s Spring season. Audiences can discover exciting and powerful theatre in these bold, outstanding dance performances at The Patrick Centre, igniting passions and taking audiences on hugely animated journeys. 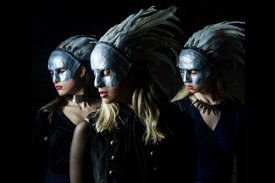 A striking dance theatre re-imagining of Shakespeare’s tragic tale of power, corruption and murder, Macbeth, will be presented by the award-winning Mark Bruce Company, following Bruce’s other hugely successful theatrical works, such as Dracula. This is what may be the most successful piece of the season, full of huge choreographic and storytelling power. Other dance works within the season include a thrilling dance triple-bill Terra Firma, which tells stories drawn from the very ground on which we build our communities, featuring choreography by Caroline Finn, Marcos Morau and Mario Bermudez Gil, and presented by National Dance Company Wales. The company is hugely popular and this looks set to be a hit. Additionally, DanceXchange will see the world premiere of DanceXchange Associate Carlos Pons Guerra’s Torro: Beauty and the Bull, a gender-questioning take on the fairy tale Beauty and the Beast. The final highlight of the season is in the form of Sinergia, created and performed by Manuel Liñán, one of the most celebrated flamenco dancers of the moment.